Driven by tough market conditions and higher procurement costs in the UK, Iberdrola’s subsidiary (Scottish Power) decided to raise wholesale tariffs to consumers (as did all other companies within the “Big Six”). The group thus expects to recover some of the lost ground in the UK to reach 2017 target growth. For Spain, no additional measures are expected in terms of tariff increases to reverse the results, besides cost optimisation measures to protect profitability. The weak start of the year with a 5% contraction in net income will be hard to reverse so as to meet full-year objectives of mid single-digit growth. Q1 is normally the stronger quarter. Iberdrola has one of the most balanced generation portfolios amongst European utilities looking forward towards the transition of the energy sector with 34% renewables, 28% gas, 25% hydro, 8% nuclear, 3% cogeneration and 2% coal. Gas assets provide the support for renewable volatility with a lower emission profile added to higher profitability at a lower capacity factor, while both hydro and nuclear provide a baseload and low emission profile to prop up the group’s own electricity demands if there is an increase in carbon prices. On top of well-diversified generation assets that match current trends in the energy sector, the company has a leading position in renewables. Iberdrola has the largest installed renewable capacity amongst European players, with leading positions in both onshore and offshore wind. 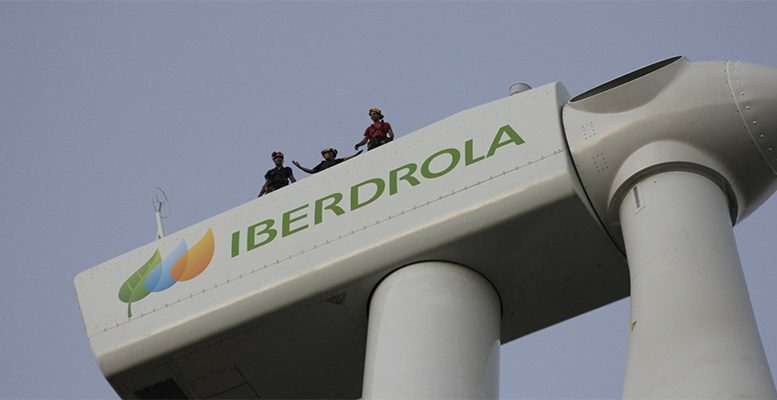 It seems that Iberdrola is reviewing different options for its nuclear assets in Spain, including a possible sale. If no direct sale is possible, the company is exploring the option to go into a partnership or joint-venture for the business with either a Spanish or foreign firm. This may attract suitors such as Endesa, Enel’s Spanish subsidiary, Gas Natural, or even Chinese investors such as CGN. With power prices set to be lower for longer (more green generation has no marginal cost beyond managing volatility of supply), the move to reduce its exposure to nuclear and power price swings is presumably a positive. 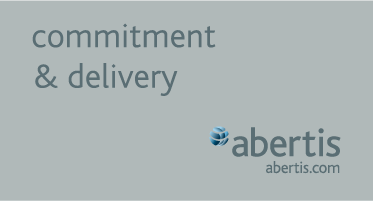 This would allow the group to concentrate on regulated and semi-regulated earnings with greater growth potential, as the company is currently attributing 88% of its investment envelope for this purpose. As both Europe and the US are mature markets in terms of renewable investment (mainly onshore and solar), the next coming trend within mature economies would be on networks, whereby substantial investment would be needed on both the transmission and distribution grids. For analysts from Carax- Alphavalue, additional capex would be needed to counter the increased volatility seen in the intraday balance of supply and demand (as renewable production is based on weather conditions rather than demand requirements), added to a decentralisation of the electricity market, and additional services required for this purpose (e-mobility, electricity storage, demand response functions). Following this strategic move, Iberdrola now has a well-diversified network business across mature economies as earnings are almost equally spread between the UK, the US and Spain, which provides a natural hedge for currency fluctuations. The network division has been the best-performing segment in 2016 as top-line earnings increased by 9%, partially offsetting the contraction in the generation and retail businesses. 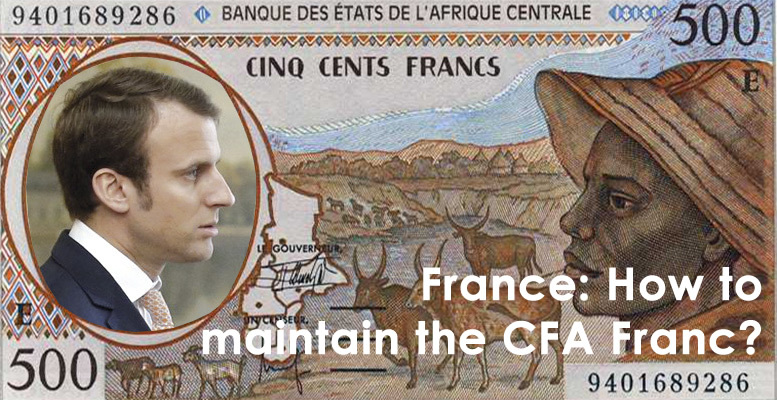 With a more network- oriented vision, the group is to allocate 42% of its €25bn investment budget to this division. Our DCF still provides some upside potential, despite relying on more cautious forecasts than the company’s expectations (4.5% vs 6%). The NAV and peer-based valuations suggest that the company is well priced after its 14% run ytd. A big chunk of the valuation upside comes from the group’s P/Book, a neat reminder of its strong balance sheet with a gearing close to 80%, well below the 120% weighted average of the sector. 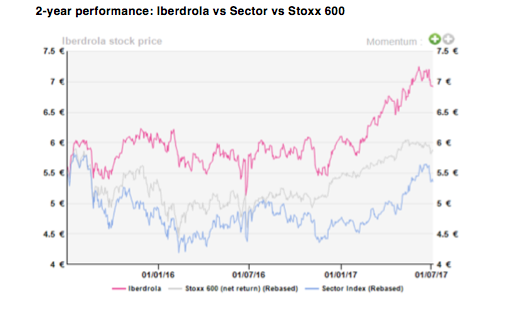 Iberdrola remains a sector pick based on the quality of its assets, growth expectations and positioning in the sector transition. Add on weakness, i.e. now that the sector is suffering from a bout of rotation away from it.